He is such a Joker. I remember the first time I have seen Joker he had just turned two months, and I will tell you he was so small. I had to pick between two little puppies. Both where the complete opposites of each other. At a certain point the breeder put Joker on a table then after a split moment he fell down on the ground, and a trophy fell on him! Joker acted like it was nothing not afraid one bit! Right in that moment I decided he was the pup for us! When I took him home he slept the whole way. I remember myself smiling the whole time at my husband, he was the dog I have always waited for. I couldn't believe he was mine. Right when I got him it was fun hard work.... I took him everywhere with me, socialized him, did potty training, and wow he was smart after one week he already knew "Sit", and "Down"! It sounds easy but it wasn't! Fortunatly they are a lot of great sites on the internet that is helping me out through the whole journey. Now Joker is 1 year old, and there is always something new to learn. He go through various "phases", and I have to admit sometimes he makes me want to pull my hair out of my head. One thing I learned from him is "patience", and to enjoy the moment. Plus my husband, and Joker helped me out a lot in life. They got me through really traumatic events. Would you recommend German Shepherds to others? Why or why not? Yeah I would recommend them to the right people. They are wonderful dogs, and they deserve to be in good responsible hands. Plus I believe a person with this breed has to be ready to move. No excuse in being lazy. There is so many.. I love training him. Right at the moment I am interested in doing Free Style with him, so I love teaching him new tricks. Anyways what I love the most of all is off leash hikes in the woods. There is nothing more relaxing away from the artificial world. Tell us your German Shepherd Dogs name and age and all about it's personality and character? Well Joker is wild fuz ball, he has a strong character, but he is really well behaved (for a one year old). He loves off leash walks in the nature, especially in the snow, or at the beach. Joker also loves playing we play a lot while we train, when he sees a toy his eyes light up! He does everything to please my family. I can't believe how a dog can love us so. I guess our only problem is that he is leash reactive (he is really good with dogs of leash), and that he suffers from a little separation anxiety (I consider it my fault). It is weird because his separation anxiety never happens at home, only when we are out and about. We are working on both. 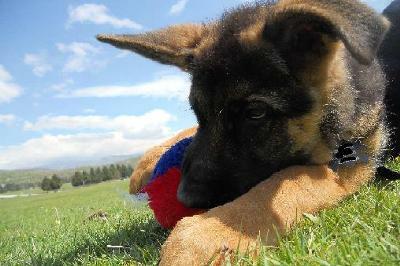 What do you like most about German Shepherd puppies and German Shepherd Dogs? I love them! I remember looking up, searching for the "perfect" breed for me, by what I have read it seem to match my personality, life style, and ect. Even if you have a mix it is really important to read up on what breed you might think he/she be to give you an idea of what he/she would be like. Only by having a GSD you realise how they are really. I remember when Joker was around 2-4 months he would nip a lot... within my mind I thought "What did I got myself into? ", but like I said when you read up and do research you will learn it is all normal GSD stuff. Next time when I will get another GSD I will be so prepared. My next dog for sure will be a GSD. Comments for He is such a Joker. What a cutie pie! Enjoy this time in his puppy stage, I wish it was longer. He will be your protector it is in the blood. He looks happy and healthy and what a joy you have with him, just we do with our Mia. Take care of you boy and he will take care of you.